The feast that the gospel of John records Jesus attending was the Jewish holiday that we know today as Hanukkah. 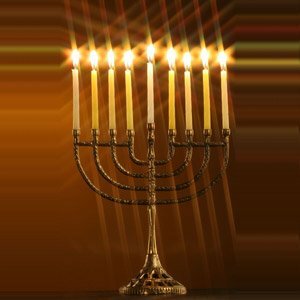 What is Hanukkah (also called the Festival of Lights and the Feast of Dedication) and what information about it is in the Bible text? Although many Christians are familiar with the name Hanukkah, most of them have no idea what it is or what it celebrates. Since it occurs about the same time as the Christian holiday of Christmas, it is the best known of the Jewish holidays and consequently, it is assumed that it is some form of a Jewish Christmas celebration. Since the Bible tells us that Jesus celebrated Hanukkah, perhaps we should take a closer look and see what it is really all about. In the Hebrew (Old) Testament, God set up seven feasts that the Israelites were required to observe. Hanukkah, however, was not one of the seven. In fact, there is no mention of Hanukkah at all in the Old Testament because it had it’s beginnings in the time period between the Old Testament and the New Testament. The word, “Hanukkah”, means, “ to dedicate”. Hanukkah is not actually a religious holiday as much as it is an historical holiday, much like our American, July 4th. Here is the story that led to the establishment of the festival of Hanukkah. The story actually begins with Alexander the Great and his conquering of the known world in 332 B.C., including the Bible areas of Syria, Egypt and Palestine. After Alexander’s death, his kingdom was divided between his generals who wrestled for control over their kingdoms from both without and within. Under the thumb of their new rulers, the Jews suffered various forms of persecution for one hundred years before deciding they had had enough. Around 168 B.C., Judea fell under the control of the Greek king, Antiochus IV Ephiphanes. He outlawed the Jewish religion and ordered the Jews to worship Greek gods. Circumcision was forbidden and all Torah scrolls were to be burned. A statue of Zeus was placed in the Jewish temple and Antiochus ordered his troops to make the Jews sacrifice a pig on their altar. Approximately 200 years later, Jesus was in Jerusalem to celebrate this same Jewish holiday (John 10:21-22) that the New Testament calls the Feast of Dedication. Today, 2000 years later, Jewish people still set aside these eight days in December to remember this great victory. They use a nine candle menorah for Hanukkah, instead of the traditional seven candle one used the rest of the year. The nine candles are for the eight days of the Feast and the ninth one is used to light the other eight. From a religious perspective, it is a relatively minor holiday; very few restrictions are placed on work or other activities. In recent years, mainly in the U.S., it has been commercialized, trying to make it more like the American Christmas, and making it equal to the much more important Feast of Passover. However, during Jesus time, it was a celebration of independence (like July 4th) from their oppressors and the re-dedication of God’s temple that was so central to their religion.